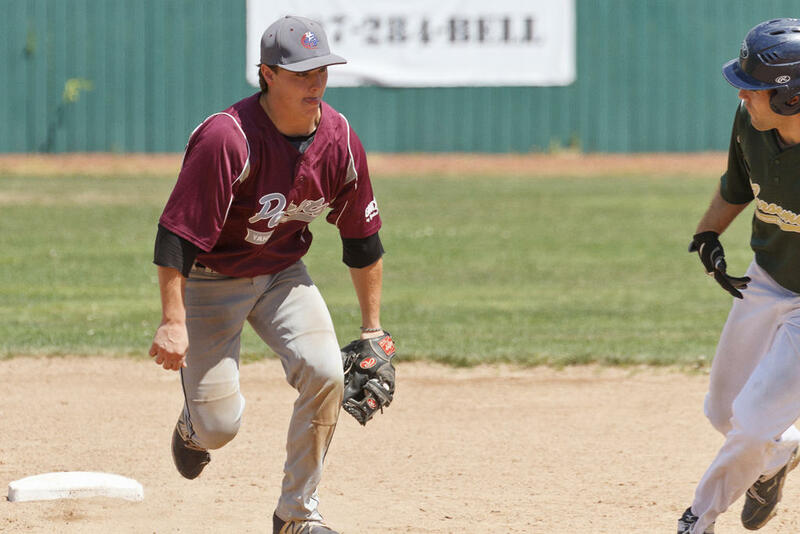 Patriots second baseman Tanner Laberge chases down a Norsemen runner caught in a pickle. OLD ORCHARD BEACH—The Norsemen picked up a playoffs win vs. the Patriots at the Ballpark on Sunday after, July 30. Kaleb Bridgham and Mathew Smith scored the game’s first runs in the bottom of the second and the team held on from there. Final tally: 4-1. Both the Patriots and the Norsemen are members of the Greater Northeast Collegiate Baseball League (GNCBL), established this summer as another developmental option for college players, one more local to Southern Maine than similar organizations, which are largely based elsewhere in New England. The outfits both looked sharp to begin the afternoon. The Patriots threatened in the top of the second, for instance, with Ryan Linehan (Bedford, University of Southern Maine) and Tanner Laberge (Windham, USM) both collecting hits, Laberge’s a bounced grounder double into centerfield. But Colton Lawrence (Farmington, USM), the Norsemen’s starter on the mound, ushered his boys out of danger with an inning-ending K vs. Drew Abramson (South Portland, Bentley). In the bottom of the second, the Norsemen put up the game’s initial scores. Leadoff man Bridgham (Minot, USM) belted a single into center; Smith (Norway, Husson) followed him to the plate and likewise singled, driving the ball into center-left. Smith reached second – and Bridgham home – when Patriots leftfielder Gage Feeney (Cutler, USM) bobbled the hit. Two batters later, Smith crossed the plate, Michael Kernan (Bedford, N.H.; New Hampshire Technical Institute) bringing him ’round with a centerfield single. 2-0. In the top of the fourth – down 3-0 after a Norsemen solo homer in the bottom of the third – the Patriots again threatened: Anthony Degifico (South Portland, USM), Linehan and Laberge loaded the bases on a walk, an error at short and a hit-by-a-pitch, respectively. But the Norsemen escaped danger once more as Abramson popped the ball up for an infield fly, the Patriots’ third out of the inning. The Patriots finally got on the board in the top of the fifth, Jack Donnelly (Walpole, Mass. ; USM) scoring on a Jared Gagne (Dover, N.H.; St. Joe’s) sac grounder toward second. But that would prove the team’s only notch of the day, while the Norsemen would add a parting shot in the bottom of the sixth, when Smith scored again, this time on a Kernan sac fly. Defensively, the Patriots turned perhaps the game’s prettiest moment, a textbook 6-4-3 double-play in the bottom of the fifth: Norseman Andrew Hillier (Bangor, USM) grounded into the trap, while Abramson at shortstop, Laberge at second and Degifico at first combined to snap it shut. Heath was particularly happy with Lawrence on the mound, as well as with Gavin Arsenault (Dixfield, University of Maine Farmington), who relieved Lawrence late in the game. “Colton threw the ball extremely well. When runners got on base, he battled, he competed. He made pitches when he had to make pitches. You expect that from him; he’s a really good competitor. And Gavin coming in, out of the bullpen, just executing pitches right away. He’s a tough pitcher to hit when he’s out there throwing three pitches for a strike.” Arsenault struck out the first three Patriots he faced. The season is nearing its apex for these squads: Sunday’s matchup was a first-round playoff. The No. 2 Norsemen’s victory advanced them to the winners’ bracket of the double elimination tournament. Meanwhile, the No. 3 Patriots slid into the losers’ bracket. A pitch slips away from Norsemen catcher Kyle Heath (Westbrook, USM). Patriot Tanner Laberge is about to wear this pitch. Patriot Cam Smith scoots back to first as a throw from the mound misses its mark and forces the Norseman first baseman to take awkwardly to the air.